Provide comfort for the family of Deacon Benjamin Latimer with a meaningful gesture of sympathy. In LIEU of flowers, the family appreciates/kindly requests contributions be made in his name/memory/honor to the nonprofit benefiting youth programs that was dear to his heart on on whose board he served: Passage to Excellence (may be done through donation tab here on website from any tab above or link below) and/or on your own to: Passage to Excellence of Bethel Baptist Church (Payable to Passage to Excellence), 1 Fisher Ct., White Plains, NY 10601. If flowers are sent despite family contribution request, since he's being buried in SC, plants or vases would be preferable and may be delivered on either Saturday Jan. 12th or Sunday Jan. 13th, 2019 by/before 6:00pm to Lee's Funeral Home; or by/before 12noon Saturday January 19th to Mt. Able Baptist Church, 130 Mt. Able Church Road, Pendleton, SC 29670. The Family Thanks You! Benjamin Latimer was born in Pendleton, South Carolina on August 21, 1937, to the late Willie C. Latimer and Corrine Latimer. He peacefully transitioned into eternal rest after a brief illness on January 3, 2019 at Montefiore Hospital, Bronx, NY. He received his high school diploma from Westside High School in Anderson, South Carolina where he ran track; played football; and was selected as captain of his basketball team. Additionally, he served his country by joining the Army and completing his three-year obligation before receiving an honorable discharge. Benjamin relocated to New York where he was employed at The County Home, a senior center in Hawthorne, New York, which was later renamed The Ruth Taylor Institute. He was afforded several opportunities for professional development and awarded the privilege of leading in several managerial positions because of his positive work ethic and perseverance. This display of professionalism would contribute to him being inducted into the Senior Hall Of Fame. Benjamin, being a devout man of God, found a new family for worship at the Bethel Baptist Church in White Plains, New York. He rendered dedicated service as a Trustee of the church and was later elected as the chair of the Trustee Board. His precise and accurate keeping of records led him to be appointed as church treasurer for many years. Benjamin was appointed as a deacon in March, 2001. The commitment to this calling expanded his ministry to include starting the Transportation Ministry; becoming president of the Men's Ministry; "Go To Deacon" for the Senior's Ministry and Chaperone/Driver for the Youth Ministry. 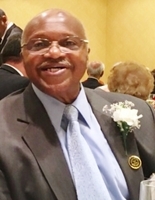 Deacon Latimer continued to be active even after retiring from 32 years of working with the County. Benjamin was a professional painter and his compassion for the elderly led him to become "The Home Improvement Guy" for seniors. He also worked at Lee's Funeral Home and The Westchester County Press until he became ill. He leaves to mourn his passing in celebration of his life; a loving and devoted wife, Sylvia, three children: Sharon Latimer-Mosley (Michael); David Christopher Latimer and Cassandra Richardson (Bernard). One sister, Willie Mae Trayman; one sister-in-law: Pollie Latimer; one Aunt, Ellen Sherard - the family matriarch; as well as, seven grandchildren and a host of cousins, nieces, nephews and friends. Benjamin was pre-deceased in death by both parents; one sister, Arah I. Wright; one brother, James A. Latimer; the mother of his children, Sudie Hardy and two brothers-in-law, Harold Wright and Johnny C. Trayman. The Entire Staff of Lee's Funeral Home, LLC is heartbroken at the loss of "Ben" who chose in his retirement to assist us in serving the community, and with whom we had a close relationship assisting alongside to attend to the bereaved as another ministry with which he chose to bless others. We therefore respect that the family of Dea. Benjamin Latimer entrusted the care of their loved one to us, and that they value the level of service & attention our funeral home provides. We are honored, in turn, to provide comfort, assistance and service to the family of Dea. Benjamin Latimer during their time of bereavement, which happens to be a time of bereavement for us as well! In LIEU of flowers, the family appreciates/kindly requests contributions be made in his name/memory/honor to the nonprofit benefiting youth programs that was dear to his heart on on whose board he served: Passage to Excellence (may be done through donation tab here on website from any tab above or link below) and/or on your own to: Passage to Excellence of Bethel Baptist Church (Payable to Passage to Excellence), 1 Fisher Ct., White Plains, NY 10601. If flowers are sent despite family contribution request, since he's being buried in SC, plants or vases would be preferable and may be delivered on either Saturday Jan. 12th or Sunday Jan. 13th, 2019 by/before 6:00pm to Lee's Funeral Home; or by/before 12noon Saturday January 19th to Mt. Able Baptist Church, 130 Mt. Able Church Road, Pendleton, SC 29670. The Family Thanks You for contributing to the youth instead of flowers! To send flowers in memory of Deacon Benjamin Latimer, please visit our Heartfelt Sympathies Store. Viewing & Services in NY will be as delineated above & below. He will then be sent to his home state of South Carolina for a Final Service on Saturday January 19th, 2019 at 12noon at Mt. Able Baptist Church, 130 Mt. Able Church Road, Pendleton, SC 29670, immediately followed by Burial in the Mt. Able Baptist Church Cemetery. ~~~~~~~~~~~~~~~~~~~~~~~~~~~~~~~~~~~~~~ In LIEU of flowers, the family appreciates/kindly requests contributions be made in his name/memory/honor to the nonprofit benefiting youth programs that was dear to his heart on on whose board he served: Passage to Excellence (may be done through donation tab here on website from any tab above or link below) and/or on your own to: Passage to Excellence of Bethel Baptist Church (Payable to Passage to Excellence), 1 Fisher Ct., White Plains, NY 10601. If flowers are sent despite family contribution request, since he's being buried in SC, plants or vases would be preferable and may be delivered on either Saturday Jan. 12th or Sunday Jan. 13th, 2019 by/before 6:00pm to Lee's Funeral Home; or by/before 12noon Saturday January 19th to Mt. Able Baptist Church, 130 Mt. Able Church Road, Pendleton, SC 29670. The Family Thanks You! Burial Saturday January 19th, 2019 immediately following church service at Mt. Able Baptist Church, Pendleton, SC. Repast in NY is immediately following service. Please park in area municipal parking lots & follow all posted parking regulations to avoid getting a ticket. Family is supplying a courtesy van to shuttle people between the church & restaurant as needed. Donations are being accepted for: PASSAGE TO EXCELLENCE CORPOATION. We encourage you to share your most beloved memories of Deacon Benjamin here, so that the family and other loved ones can always see it. You can upload cherished photographs, or share your favorite stories, and can even comment on those shared by others. Provide comfort for the family of Deacon Benjamin Latimer by sending flowers.